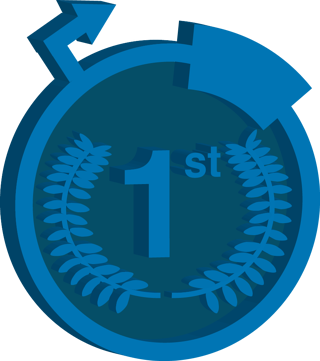 Similar to last year, the top requested plasmid from 2016 is an expression vector for CRISPR nuclease, SpCas9 from the Zhang Lab. It's name, though a little confusing to the uninitiated, contains much of the information needed to understand how to use it. TLDR: This is a versatile mammalian expression vector that you can use to express both SpCas9 and your gRNA in a variety of mammalian cell types. 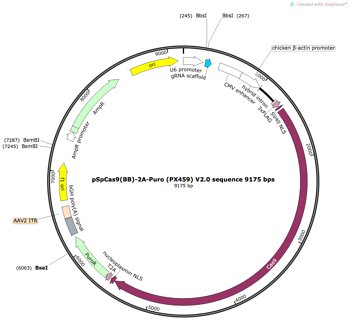 This plasmid expresses Streptococcus pyogenes (Sp) Cas9 from a Cbh promoter. Cbh is a modified version of CAG promoter that the Zhang lab has tested in a variety of mammalian cell lines. Cas9, of course, is the key component of most CRISPR systems and generates double strange breaks at target sites 5' of the 5'NGG3' PAM sequence as directed by a gRNA. In this plasmid, SpCas9 is fused to the puromycin resistance gene through a 2A peptide. The puromycin resistance gene enables selection of cells with the plasmid post transfection. The 2A "self cleaving" peptide causes the ribosome to translate Cas9-2A and the Puromycin resistance gene as separate peptides. This is the vector backbone. This particular backbone can be used to transfect a variety of mammalian cells and can be modified for viral trasduction (see the Zhang Lab's Nature Protocols Paper for more information). This designation separates pSpCas9(BB)-2A-Puro (PX459) V2.0 from it's predecessor, which had a point mutation in the puromycin resistance gene that made it less effective in certain cell lines. This point mutation has been corrected in V2.0. Not included in this plasmid's name are some additional features. The first and most imporant is that, upstream of the Cbh promoter, this plasmid has a U6 promoter followed by BbsI restriction sites into which you can clone your 20 nucleotide guide sequence of choice (for generation of a gRNA that will target SpCas9 to the approrpriate cleavage site). Finally, in addition to the 2A peptide on its C-terminus, SpCas9 is also fused to a 3X FLAG tag at its N-terminus. This tag can be used to test for SpCas9 expression post transfection by western blot. Overall, this is a versatile mammalian expression vector that you can use to express both SpCas9 and your gRNA of interest in a variety of mammalian cell lines. Alternative forms of this vector contain GFP-tagged and un-tagged versions of SpCas9 and further variants replace SpCas9 with SpCas9n (nickase), which nicks DNA rather than creating double stand breaks and may better facilitate homology directed repair. You can find all of these variants, as well as links to the Zhang Lab's Nature Protocols Publication describing them here. 1.Ran, F. Ann, et al. "Genome engineering using the CRISPR-Cas9 system." Nature protocols 8.11 (2013): 2281-2308. PubMed PMID: 24157548. PubMed Central PMCID: PMC3969860.